From the five-piece, Wisconsin band The Dust Of Men, this is the title track from the subtle masterpiece and debut album ‘What The Morning Shows’. It’s been a busy year! Our audience has increased hugely – the YouTube channel now has over 12,000 Subscribers and total video views currently stands at 1.5 million! Amongst the growth though with some help from friends and family I’ve been in touch with more artists to bring you another free summer mixtape and here it is. It’s not as long as last years, at just 11 tracks but I’d rather deliver a shorter mixtape of top quality music than fill it with anything I could get permission for! Be encouraged by their music, share it with friends not just because you secretly hope they’ll become Christians through it but because it’s simply a collection of great music! Enjoy the diverse mix of genres, the different ways that people praise God and the different stories people have to tell. And finally thanks to you the listener for the continued support to both the blog and the artists we feature, whether it’s simply by liking a link on Facebook, sharing the blog with friends or donating money so that we can give more copies of the mixtape away. Thank you for making this possible. Having started as a solo project by Manchester native Jonathan Ogden (lead vocals and keyboard), Rivers & Robots has since gained three more members, David Hailes (guitar and ukelele), Nathan Stirling (bass, guitar and percussion) and Kelani Koyejo (drums) as of 2012 and are now releasing their first album as a four-piece group. With a firm foundation of two strong solo albums – The Great Light (2011) and Take Everything (2012) – the expectations were high with their latest release All Things New and I can confidently say that they have met all of them and even exceeded these expectations in many places. When I first heard Rivers & Robots two years ago, what drew me to Jonathan’s music was the originality in the style and specifically the way he structured his songs. Regardless of what the rest of the worship scene was doing he always produced what he felt God had put on his heart and it always paid off. 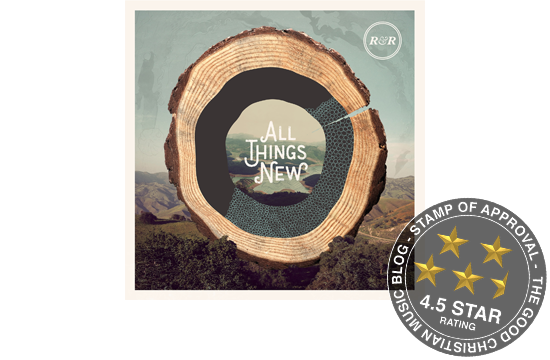 Pleasantly, with this album that remains just as true, and as a group they haven’t bowed to the pressure of writing simple songs that churches can sing all around the world but sing their own song, in their own style and it sits in stark contrast to the sound of contemporary worship music. Starting as they mean to go on, the album opens with the chilled anthem ‘We Have Overcome’, beginning with just claps and acoustic guitar it screams organic indie worship without ever feeling forced or copied. Although it doesn’t give much description, the best adjective seems to be that it simple sounds very British – influences of bands such as Bombay Bicycle Club, Coldplay and Bloc Party reach you much quicker than any Christian music influence does and it’s incredibly refreshing! Jumping in to the upbeat ‘Perfect Love’ followed by the charming ‘White As Snow’, it’s clear that one of Rivers & Robots values is quality, thoughtful lyrical content which firmly sticks to a specific theme.With each track they uniquely hold on to their indie roots whilst fully embracing the heart of worship music. Comparing the album to their past work, the production has also stepped up a notch, they may not be professionals but the quality of their music could stand alongside any major worship group and still shine. On the topic of production the particular stand out track is the electronic/sample based ‘Fall Down’. Luscious ambient vibes are littered with interesting sounds like guitar harmonics to create a unique interlude from the rest of the album which works beautifully. Another album highlight is the song ‘You Hear Me’, a chilled acoustic track about prayer and how even though God knows our thoughts before we bring them to Him, He still wants us to come and speak to Him. Also, in a similar vein is ‘Keep My Fire Burning’ a gentle, intimate piece of worship that wouldn’t be out of place if sung beside a campfire. It’s in the songs like this as well as ‘Light Will Dawn’, and ‘Voice That Stills The Raging Sea’ where Rivers & Robots are really at their best. Although there are moments in the album where the tempo is upped, on the more upbeat tracks the climax can sometimes fall slightly flat, the songs may build and build but it never fully feels like it reaches where it’s heading. It’s not a huge criticism as the album works well as a calm, chilled, folky worship record but the change of pace would work nicely if the upbeat tracks delivered a little more. Overall, this album really sets the bar high, and as a band they have produced a brilliant record. All Things New is coherent in style and the input and musicianship of the the new band members really comes through in many beautiful and subtle moments of the album (such as the slide guitar on the final track) and they haven’t made the usual mistake of favouring a pop influenced overproduced sound. Already leading worship at a few events and playing more and more live shows these guys are sure to have bigger things in store and if they continue to stay true to their organic, indie, British sound they’ll definitely be turning heads as they go – this truly is must have music. Downtempo Indie Worship band Loud Harp are back after successfully crowdfunding their second album, titled ‘Asaph’. As the band themselves write, they now have a new focus with their music, “no longer songs from the bottom of the pit, these are the songs of a people ascending the hill of the Lord.” The familiar chilled, progressive acoustic sounds of these worshippers remains, but now perfected with extra subtleties in their compositions; with the centrepiece of the album being these two tracks that start as an instrumental that builds in to a meditative chant in the second song (121) I Lift My Eyes. My constant help in trouble.